Bodacious Dream is a Kiwi 40FC – a “Class 40″ design from BTboats of Wellington, New Zealand. Class 40 refers to a specific class of boat. The Class 40 is a “box” rule that has specific parameters for design limitations that include a number of things, but simply put, length, draft and beam etc. must conform to the design rules. There are some areas where designers can modify the design to make a boat faster in certain conditions, but these generally result in reduced speeds in other conditions… trade-offs are a part of the boat design business. The Class 40 boats are designed to be efficiently handled and raced by one or two people in offshore or trans-oceanic events. 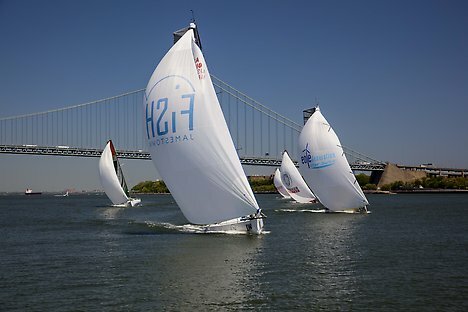 Another aspect of the Class 40 rule, is that they specifically limit exotic materials, equipment and construction in order to constrain cost and so encourage the building of safer and more reliable platforms which, by regulating all competitors within the rule, allows all boats to race on a more equal level. 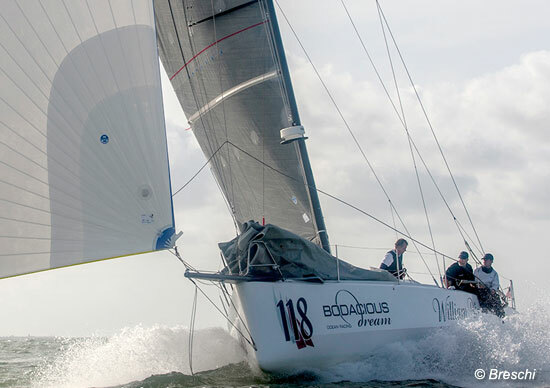 In much of sail boat racing, designers are looking for the next speed edge… either with lightweight construction, exotic materials or breakthrough design innovations. With the Class 40, there is very little speed difference between designs and generations. Presently, the Class 40 boat designs are into their Fourth Generation of design. 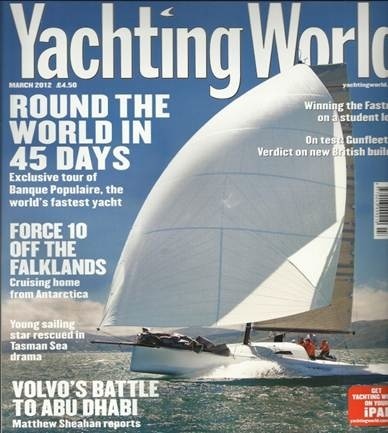 Designed by Farr Yacht Design, the Kiwi 40FC is exemplary of that third generation Class 40. It is a design refined to optimize the racing edge of the spectrum. From the pre-launch time-frame, here’s a well-made 7 min. video and interview with Lapo Ancillotti from BT Boats, the New Zealand-based builder of Bodacious Dream. Here he is talking about the boat’s unique and state-of-the-art qualities. Some cool on the water footage can be found here as well.